We have great news this morning that Lambeth council will get cash to make walking, cycling and living in Brixton better. This should be a big step forward and we look forward to working with the council to help deliver on its successful bid. The Liveable Neighbourhoods money from TfL should mean big improvements to safety for people walking and cycling and for people travelling on buses in and around Brixton. 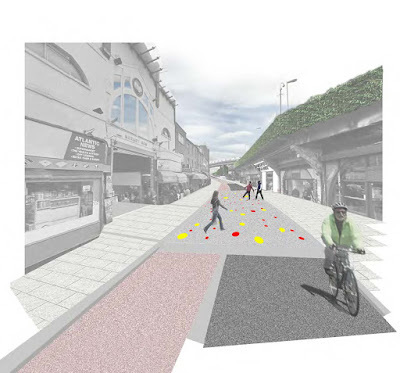 Lambeth's plan is focussed around Atlantic Road, which will transformed for people walking, cycling and using the bus. The TFL money will overhaul public spaces, widen pavements and add pedestrian crossings, creating a much more welcoming environment for the area’s visitors, residents and businesses. 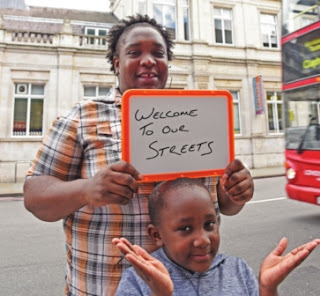 Lambeth Cyclists say "Lambeth has long claimed to want to be the most cycle friendly borough - the liveable neighbourhood will be a big step towards making that a reality. More importantly, this isn’t just for people on bikes - low traffic neighbourhoods mean cleaner air and better conditions for walking too. A higher quality environment in central Brixton is great news for our independent traders, with better walking and cycling links to other centres bringing in more customers." The project will build high-quality infrastructure on three key strategic cycle routes: Brixton to Clapham Common, Brixton to Camberwell and Brixton to Herne Hill. Low traffic neighbourhoods will be created in the Ferndale Road and Railton Road areas and a new, fully segregated cycle route linking to the Loughborough neighbourhood. What is the Liveable Neighbourhoods Programme? The Liveable Neighbourhoods Programme provides funding specifically for area-based walking and cycling projects. These are the successors to the “mini-Holland” schemes in Enfield, Kingston and Waltham Forest that London Cycling Campaign won from previous mayor Boris Johnson. In the run-up to Sadiq Khan’s election as Mayor, the London Cycling Campaign got him to “Sign for Cycling” and pledge to make available funding for all London boroughs for such programmes – so these Liveable Neighbourhoods are also down to LCC campaigning! Could we get safer, cleaner school streets? Lambeth Council has started a consultation on the first School Street in the borough. School Streets aim to create safer streets and less polluted air by closing the roads around a school to motor vehicles during drop-off and pick-up times. This first in Lambeth is proposed for Immanuel and St Andrew CE Primary School in Streatham. Lambeth Cyclists supports School Streets to make getting to school safer and to tackle the poor area around many of our local schools. As Lambeth Council says, even in a borough with low car ownership such as Lambeth, roads around schools are often clogged with traffic at the beginning and end of the school day. We think the proposal could be more ambitious but hope you will support it. Find out more and respond to the consultation by 11pm on Monday 4 March. Lambeth's Transport Strategy Consultation - Respond by Monday 17th Dec! Lambeth Council is consulting on its draft Transport Strategy and LIP, the implementation plan (LCC guidance). This doesn’t just set out the borough’s spending plans on transport for the next three years but also their approach for the next 20 years. So we really need as many people as possible to use this moment to tell the council we want more and better walking and cycling. And no more ratruns, no more polluted main roads. The strategy’s “Guiding Principles”, “Strategic Outcomes” and “Healthy Routes” approach (protected space for cycling on main roads and filtering out rat running traffic in areas away from main roads) are all good. But they’re not reflected in any short term actions and targets. It’s all fine words, but no action. Little surprising then that in the last five years, TfL data says walking and cycling have flatlined in Lambeth. The Healthy Routes “flagship” plan to get much more than a paltry 7% of the plan budget. We think this should be at least 25% (the amount currently proposed for soft ‘training and encouraging’ measures) but to be really effective even higher. A cull on traffic calming schemes that have been failing to deliver. Some roads the borough is proposing to revisit a second or even third time and they’re still seeing far too high speeds, whereas cheap “low traffic neighbourhoods” would remove ratruns and reduce speed more effectively. Real political leadership on these issues - better cycling and walking, reducing motor traffic dominance are a “matter of social justice” says Jeremy Corbyn. Pollution, inactivity, climate change affect the poorest in our borough most. And these are crises tearing apart our NHS, killing Londoners and threatening our planet. We want hard, bold targets and action from Lambeth, not more words. “I have been a councillor for a long time. I spent years talking about encouraging a shift to bikes and walking without actually doing the things that make a difference. If I am honest I was tinkering with parking schemes and pandering to car owners. I was not delivering for our community. Then I got a chance to do something extraordinary. We won our Waltham Forest mini-Holland bid with low traffic neighbourhoods and protected bike lanes. We had signed up to deliver a huge public health implementation at pace. Let’s make Lambeth better together. Send in a response (in your own words) today, the consultation closes on Monday 17 December. Meet: 10.30am outside the cafe (north side) in the middle of Brockwell Park. This ride will look at two 'pioneering' approaches to house building and design. Our first visit will be to Walter's Way near Honor Oak, a reprise of our visit last year. The houses here were built by the residents themselves using a system designed by architect Walter Segal that did not require specialist skills. The spirit of self build and community housing continues today by various organisations and is an interesting solution to housing needs. Our second visit will be to the Cator Estate in Blackheath to see some the examples of 'Span' housing, so called as they were designed to cater for the middle ground between large council estates and mansions for the wealthy, and to create genuine communities. They may look familiar now but at the time they were a radical reaction against the mock Tudor prevalent in post war architecture, using new construction techniques, featuring open plan interiors with large areas of glass, and integrated with landscaping. It's likely that we will have a lunch stop between the two visits depending on timings, likely to be in Blackheath town centre. We should be finished by 4.00pm. In the 250th year of Lambeth circus and the bicentenary of the Old Vic, discover the locations and hear tales of Astley’s Amphitheatre, the Canterbury Hall of Varieties and other local South London venues. More details here.